Southern Humboldt County in California seems like another very unlikely place to find an accomplished Pinot Noir winegrower and winemaker. 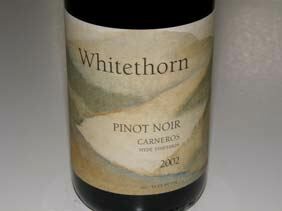 Whitethorn is a small community in the southern-most reaches of Humboldt County (so-called “so-hum”). This is where Tasha McCorkle McKee and her Whitethorn Winery can be found. By 1998, she had increased production of several varietals from multiple vineyard sources to 1,300 cases per year. She was producing superb Chardonnays and Pinot Noirs sourced from Hyde Vineyard in Carneros and Hirsch Vineyard on the Sonoma Coast. Some personal and lifestyle issues intervened five years ago, and the last Pinot Noirs she made were the 2002 Hyde Vineyard and 2002 Hirsch Vineyard. When I spoke with her last year, she planned to resume her winery sourcing grapes from Demuth Vineyard in the Anderson Valley and Hyde Vineyard once again. 2015 update. Tasha's son, Galen, has taken over operations of the winery. 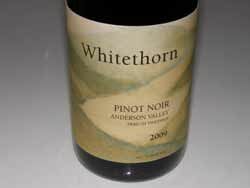 Whitethorn wines are available primarily in San Francisco Bay Area fine restaurants and retail stores. She does not release her wines until she considers them ready to drink. The winery is about two hours north of the Anderson Valley. The winery is open by appointment (707-986-1658). Two annual open houses are held Thanksgiving and Memorial Day weekends.